A few years ago at TESOL-SPAIN, I saw a great talk by Catherine Morley about using dictation in the class. She demonstrated a number of activities and one which has always stayed with me is “A 2 Day in 5“. One day (12) was walking in (6) when s/he saw something very strange. It looked like a (3) person, but it had (1) skin and (10) (4). (12) went closer and asked “(7)” “I don’t know,” replied the alien. “But I’m hungry and I want to eat a (11) (9) (2). (12) thought this was very odd, so s/he called (5) and together they took the alien to the (8) and started (13). I’ve done the Shark Attack activity recently with a couple of groups and they really enjoy the task – it’s an easy, enjoyable, controlled practice activity of the past continuous. However, I was doing a lesson today with past continuous and past simple and adapted the activity so learners would use both tenses. Ana and Elena were swimming in the sea. When the shark attacked, they died. Álvaro and Carlos were playing football. 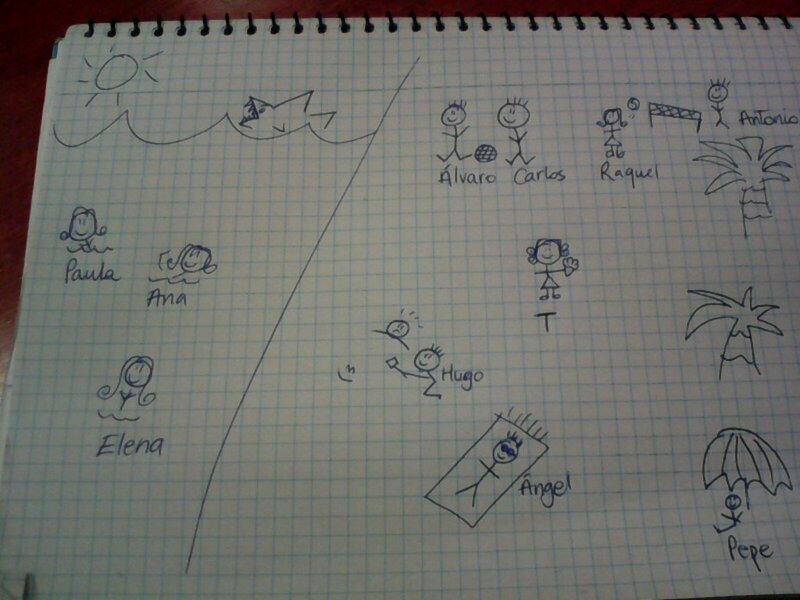 When the shark attacked, Álvaro jumped into the sea to save the girls and Carlos called the police. Pepe was sitting under an umbrella. When the shark arrived, he saw Pepe and they fell in love and moved to another country. This is an easy activity to get learners speaking and practising question words. Give learners a piece of paper and tell them to draw eight clouds, with a topic in each. Then they write one question in each cloud, after which they interview a partner. After the interview, learners swap papers with their partner and add another question to each cloud. Then they interview a different partner, swap, add another question, and so on… It keeps learners motivated as they talk to different people and the questions vary a little each time. 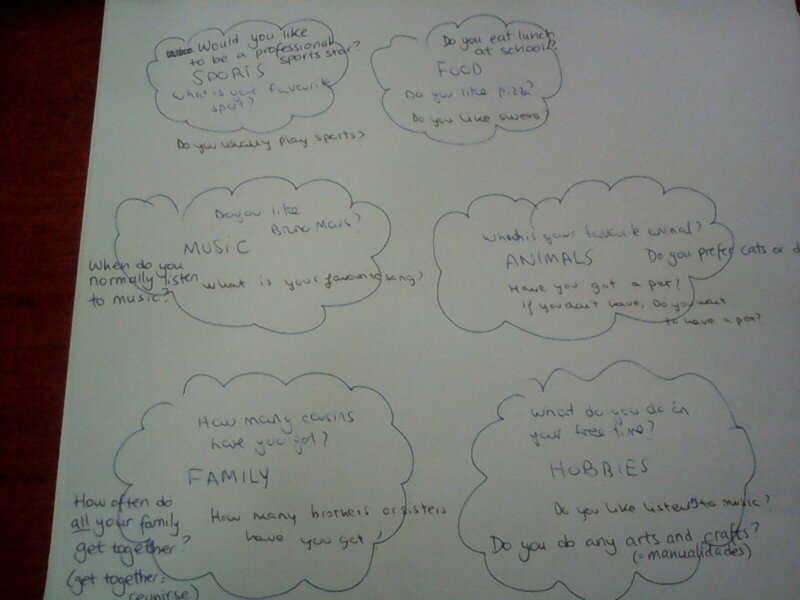 Also, they have to think of more questions about each topic and classmates may have chosen different topics. I have a wonderful C1 group this year who aren’t currently interested in the CAE exam or GESE but simply want to keep up their level of English. The classes are largely communicative, with discussions on various themes and slightly Dogme-esque*, but they’re also looking to revise grammatical points, increase their vocabulary and focus on aspects of pronunciation. 1. Give learners a copy of the story and ask them to underline all the incidences of “ough” without worrying about understanding the story or vocabulary. 2. Read the text to the learners, then show them the different pronunications of “ough”. They then work in pairs to categorise the words according to the pronunciation – it often helps to read the story a couple more times whilst they’re doing this. 3. Feedback and drill the pronunciation. Then check any vocabulary queries. 4. Give learners time to practise reading the text alone, then to a partner and as a whole group. 5. Follow on with some creative writing: learners write the next sentence of the story, then swap papers. Do this perhaps four or five times until the last person writes the ending to the story. 6. Quickly underline any mistakes in their texts and give the stories back to pairs to error-correct – this also works well if done a number of times; so one pair checks a story and puts it back in the middle of the table, w second pair reads through their corrections, etc. 7. As a final stage, I asked learners to read out the stories and then discuss which they thought was the most realistic, the most romantic, which had the best ending, etc. So, what did you do over the holidays? Well, it’s that time of year again! We’ve just finished the Christmas holidays and are ready for the second term to burst forth. And, as a typical first lesson back, we’ll no doubt be asking students about their Christmas holidays and asking them to share their experiences with the class. Everyone has something to say about the festive period and whilst it’s fun to hear about what everyone got up to, it can be time-consuming and in fact a little boring. Here’s an activity which I picked up from one of my colleagues, Phil, which has a great twist of the standard information share. Give each student three pieces of paper and ask them to write a sentence on each about what they did over the holidays, but they MUSTN’T write their name on the paper. Collect in all the papers and then give instructions for the next stage. Give each student a slip of paper and they must convert the sentence into a question*, which they will then ask different members of the class to find out who wrote it. Everyone stands up and mingles to complete the activity – when a student matches a slip of paper to a classmate, they write the owner’s name on it and take another piece of paper. When you’ve used all the pieces of paper, students sit down and take a moment to correct any errors on the slips (again, depending on the level of your learners). You can monitor and help where necessary. Then ask each student to choose one piece of paper which they find interesting. They then have to write a follow-up question to what is written on the slip of paper. When they have done this, there’s a stage of whole group feedback. Invite a student to read the sentence and ask the follow-up question to their classmate. After everyone has read their slips of paper, if you notice that a student hasn’t had the opportunity to talk about their Christmas experiences, you could invite a classmate to read one of their sentences and ask a follow-up question. This activity is fun as it gives the students lots of opportunities to speak and find out about each other’s holidays without becoming a long, tedious activity. If you have higher level students, you could ask them to transfer the sentence into reported speech before reading out the sentence and asking the follow-up question. Category: Speaking | 1 Comment on So, what did you do over the holidays?